No better way to gear up for the weekend than with a little Friday Jr. celebration! We’re excited to bring the fun to Upper King on Thursday nights with karaoke, live music, themed trivia nights and Bar Bingo, sponsored by Bold Rock and Holy City Brewing! Join us for a round of Bar Bingo next Thursday, February 21st. We’ll be featuring $5 Bold Rock and Holy City cans. So grab your go-to group, order a round of Tot-Chos and wings and settle in for a fun night of calling BINGO! Can’t make it this time? We will be hosting Bar Bingo every third Thursday of the month from 8-10PM. And we’re ending February with a bang! 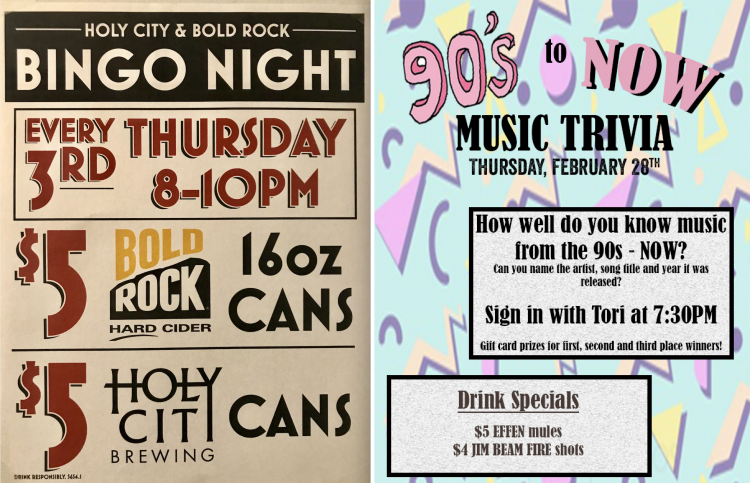 On Thursday, February 28th, we’re hosting music trivia featuring music from the 90s to now. Drink specials will include $5 EFFEN Mules and $4 Jim Beam Fire shots. Sign in starts at 7:30PM.